A wildfire destroyed most of a Northern California town of 27,000 people. A Cal Fire spokesman said “there’s nothing much left standing” in Paradise. On Friday morning, the director of the California Governor’s Office of Emergency Services said the so-called “Camp Fire” has claimed lives. Mark Ghilarducci said the number of deaths was not known. Two more fires are burning north of Los Angeles. Fires across the state have forced 157,000 people from their homes, Ghilarducci said. A law enforcement official said that there was congestion on roads in an evacuation area near the so-called “Woolsey Fire” in Southern California. Division Chief John Benedict of the Los Angeles County Sheriff’s Department told reporters that people were evacuating an area south of the U.S. 101 freeway between Las Virgenes Canyon Road and the line between Los Angeles and Ventura counties. Benedict advised people to travel toward the coast and then east toward Santa Monica on the Pacific Coast Highway to ease the congestion. Benedict urged people evacuating to remember their identification, medication, personal documents and “anything that you might think that you’re going to need down the road. “This thing moves fast, and you need to be prepared, so if you’re ready to go, go, and if you’re being told to go, get out of there,” Benedict said. Mahmoud El Tahawy of Egypt looks out at smoke from wildfires obscuring the San Francisco skyline behind the Golden Gate Bridge Nov. 9, 2018, near Sausalito, California. Authorities issued an unhealthy air quality alert for parts of the San Francisco Bay Area as smoke from the Camp Fire drifts south, polluting the air. 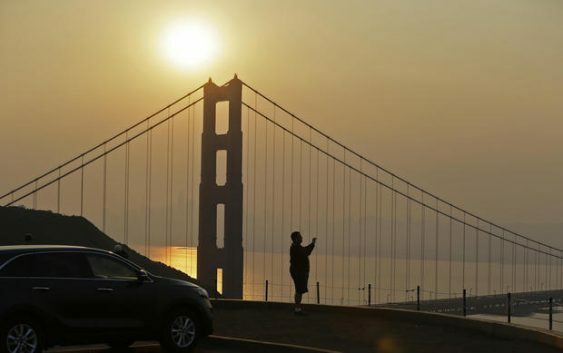 The air in San Francisco Friday was hazy and the smell of smoke was overwhelming. Officials advised older people and children to move physical activities indoors. All people were encouraged to limit their outdoor activities. A structure is seen engulfed in flames during the so-called “Camp Fire” in Paradise, California, Nov. 8, 2018. A California fire official said the Camp Fire nearly quadrupled in size overnight. Capt. Scott McLean of the California Department of Forestry and Fire Protection said the fire near the town of Paradise has grown to 70,000 acres, which is nearly 110 square miles. About two-thirds of the city of Malibu was ordered evacuated early Friday as the Woolsey Fire roared toward the beachside community that is home for many Hollywood celebrities. Malibu officials initially said the order issued early Friday applied to the entire city before reducing the order’s scope. The Los Angeles County Fire Department tweeted that the fire raging through the Santa Monica Mountains was headed to the ocean. Malibu has about 13,000 residents and lies along 21 miles of coast at the southern foot of the mountain range. “Imminent threat!” the department said in its warning. The erupted Thursday near the northwest corner of the city of Los Angeles as the region’s notorious Santa Ana winds gusted, triggering overnight evacuations of an estimated 75,000 homes in western Los Angeles County and eastern Ventura County. The fire then pushed southward, jumped the wide U.S. 101 freeway before dawn Friday and pushed into the Santa Monica range. Meanwhile, the so-called “Hill Fire” was burning farther west in Ventura County and was also moving toward the ocean. Surrounded by walls of flames whipped by winds of 50 mph, people drove through hell trying to escape, CBS News correspondent David Begnaud reports from Paradise. “Heavenly father, please help us,” a woman said on a video while driving on a road bookended by flames. The Camp Fire exploded in intensity, filling the sky with toxic smoke that could be seen from San Francisco, which is nearly 150 miles away. “Everything is burning up around us,” a woman said on a video posted to Facebook. There was very little time for the 27,000 people who live in Paradise to evacuate. “We grabbed our animals and some food and some clothes, and we’re getting the heck out of here,” Kevin Winstead of Paradise told CBS Chico affiliate KHSL-TV.